For his senior season, C.J. Allen-Jones (33) is moving from Hawaii's crowded linebacker corps to the defensive line. He has some familiar company. His brother Cameron is moving to the defensive line from the offensive line. A coach often sees the benefit of a position switch before a player does. Such is true with Hawaii defensive end C.J. Allen-Jones, who has come around to Greg McMackin's way of thinking a year later. Formerly an outside linebacker, Allen-Jones has bulked up and moved to the line of scrimmage this spring in anticipation of his senior season. "Coach Mack wanted me to switch last year, around spring camp, the same time. I said, 'Coach, I'm a linebacker, I love linebacker.' I didn't see myself moving to another position and learning things all over again," Allen-Jones said. 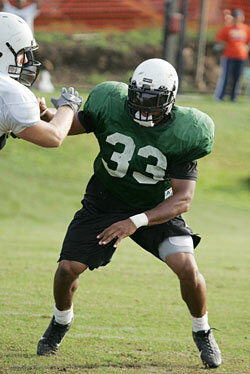 Allen-Jones opened four of UH's first five games at weakside linebacker in 2006 before Micah Lau took over the starting role. Last year, the Warriors went to a three-linebacker scheme instead of the 3-4; Allen-Jones found himself among three former starters out of a job at the talent-rich position. "After the bowl game I talked to Coach Cal (Lee) about making the switch over and they were very excited," Allen-Jones said. They -- McMackin and defensive ends coach Dave Aranda -- still are. The coaches like the potential of Allen-Jones' brother, Cameron, too. The junior is also transitioning to defensive end, after moving from the offensive line. "Both C.J. and Cameron are very bright," Aranda said after a recent practice. "They pick up everything. You tell them one time and then they've got it. C.J. has been on defense as a linebacker, so some things come a little more natural to him. (Last Thursday) was a big day for Cameron in terms of turning a corner with some of the techniques we're teaching him. We're working on minimizing his movements." Cameron is the bigger of the two at 6-foot-2 and 256 pounds. C.J. is packing 245 pounds at the same height after playing at 218 pounds last year. "C.J. is gonna be more of a speed up the field rusher," Aranda said. "Cameron is a staunch run stop guy and we're working on his pass rush." Cameron said the brothers, who live together in Makiki with C.J. 's wife and baby daughter, compare notes nightly. They are competing at different sides of the line, so there's no awkwardness. "I'm working a lot on technique. It's a rebuilding and learning stage for me," said Cameron, who transferred from Marshall two years ago. C.J. said he knows he can't learn everything and transfer it to the playing field in one day. "I think each day I'm progressing. Give me a week. Next week I'll be good. Tomorrow I'll be good. Every day I just want to make a step to improve my technique. I know I have the speed, I know I have the power. Bring them all together and use them as one," said C.J., who uses Dwight Freeney of the Indianapolis Colts as a role model. "He goes up against big guys and has to use his speed. I look up to him also for the mental aspect. He's smart, and he has the speed. He has the quickness to get around the guys. Also the guy (Marcus Howard) we played against in the Sugar Bowl. He was just 238, so he used straight speed." Even if C.J. can't crack the defensive lineup, he'll still be on special teams -- which he's excelled at since his true freshman season of 2004, when he sprang Chad Owens for some of his record-breaking punt returns. But McMackin is confident both Allen-Jones brothers can contribute on the D-line, even if it is a year later than he expected C.J. to make the move. "Both are progressing and learning and both are good athletes," McMackin said. "(C.J. will) have to go through a process because he's got his hand down. But I've done it with a lot of players and that position is just an outside linebacker with his hand down on the ground, so he just has to get used to that. He's got such great quickness and power."